Kent residents are being asked for their opinions on the Kent County Council’s plans for maintaining and improving public footpaths and bridleways. KCC has launched a 12-week consultation on its Public Rights of Way strategy for the next 10 years. Efficient delivery – why the Public Rights of Way and Access Service must use resources available to secure the greatest benefits for the public. However, members of the public have the chance to say whether these themes are the correct priorities and make other suggestions. The consultation is open until 12 September, and the questionnaire can be completed online at www.kent.gov.uk/rightsofwayimprovementplan. To request hard copies of any consultation materials, residents can email alternativeformats@kent.gov.uk or telephone 03000 421553. Mike Hill, KCC’s Cabinet Member for Community and Regulatory Services, said: “Our Public Rights of Way and Access Service looks after a network of about 4,300 miles of footpaths and bridleways, giving the public access to the county’s wonderful countryside and coastline. “Officers have been carrying out detailed research and analysis to produce this plan, which builds on the achievements of the past 10 years. The plan set out our vision for the Rights of Way network and how KCC will work towards delivering this over the next 10 years. 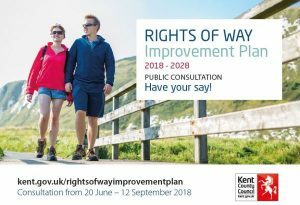 KCC would like your views on the Rights of Way Improvement Plan 2018 – 2028 to ensure that it meets the needs and expectations of Kent residents. The draft Strategy is available to download from the ‘Documents’ section below. Please let KCC know your thoughts by completing the online questionnaire (via the ‘Respond to this Consultation’ section below). KCC have published a copy of our Equality Impact Assessment (EqIA) for you to read and make comments on via the consultation questionnaire. Your responses will be compiled into a consultation report, which will help produce the final version of the Rights of Way Improvement Plan. Please note this consultation closes at midnight on 12 September 2018.